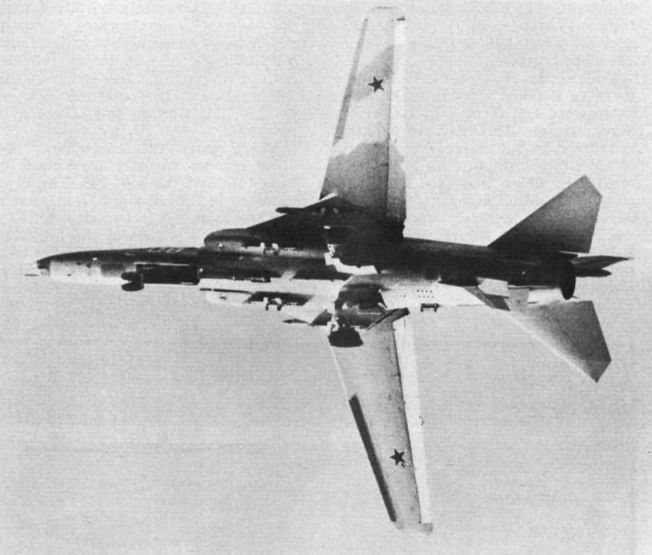 The MiG-23 makes its debut over Domodedovo, in July 1967. The wings sweep through their full travel in 11 seconds. 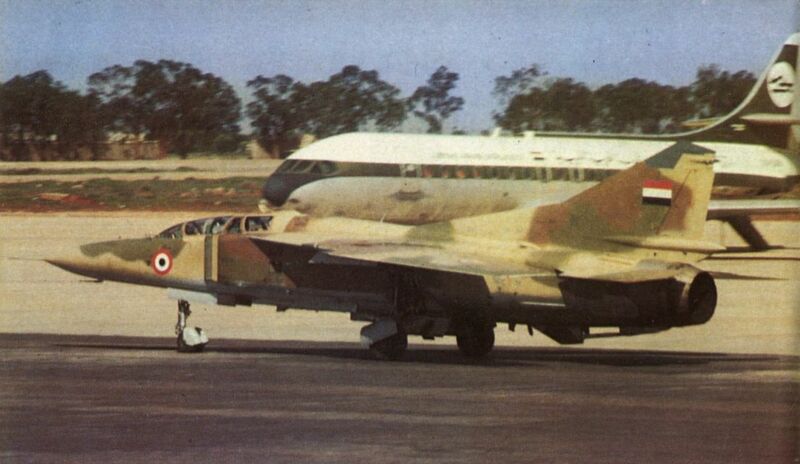 Two SovAF MiG-23S fighters. The fighter has a shorter nozzle than the prototype, radar, a laser installation and four missile pylons. The inner pair sometimes carry small electronic countermeasures pods instead of weapons. The MiG-23S is in service with the SovAF Air Defence Forces, replacing earlier MiG-21 interceptors. 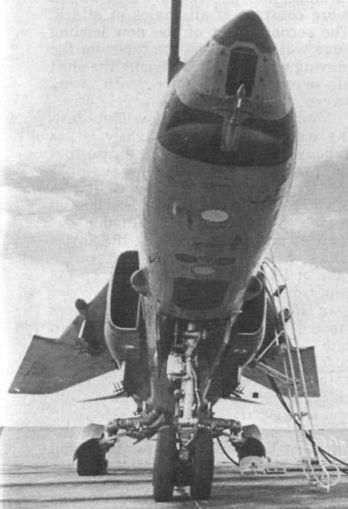 Note the ventral 23mm cannon, with prominent ejector chutes. 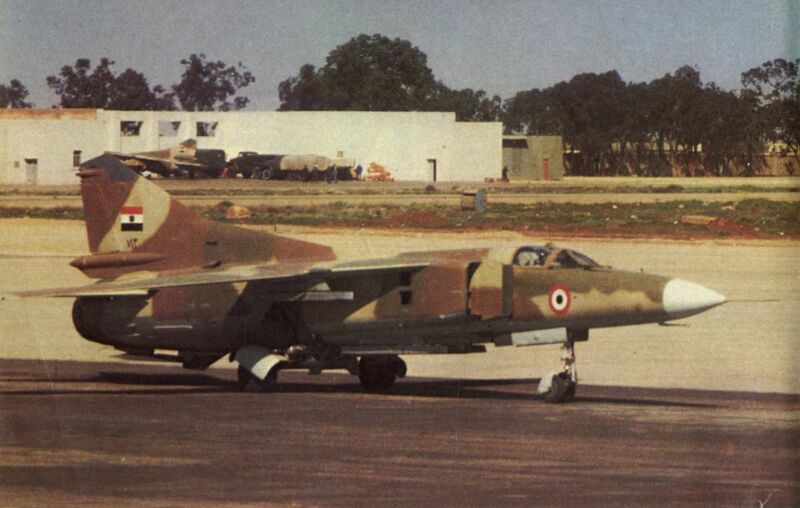 MiG-23 export model of the Libyan Air Force. 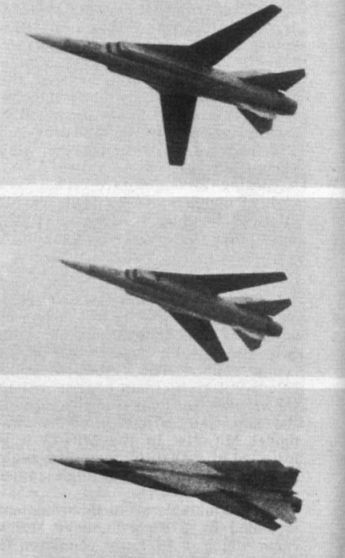 The nose radar is smaller than that of the MiG-23S. Note aerials recessed into glove leading edges and "claws.” Dark panels under the nose are radio altimeter aerials. 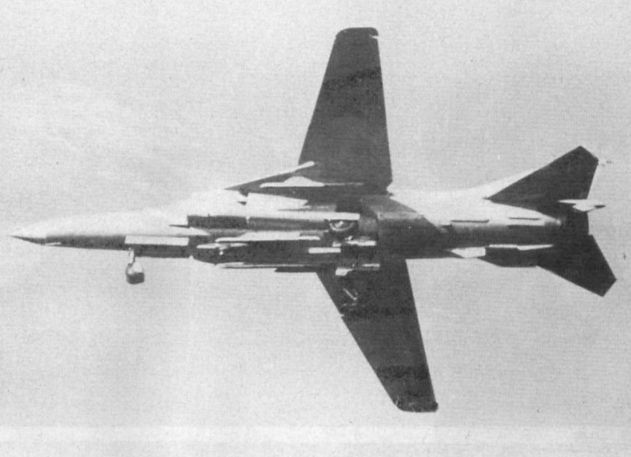 MiG-23B carrying four 250kg bombs. Note terrain-avoidance radar under nose, just behind window for laser ranger. 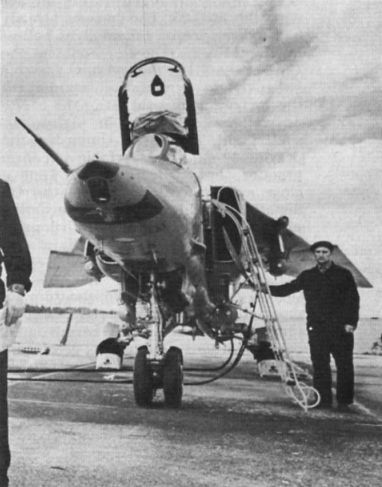 The MiG-23B is fitted with Doppler ahead of the nose wheel bay. Note optical (port) and electronic (starboard) sensors above glove pylons, probably with missile-guidance role. 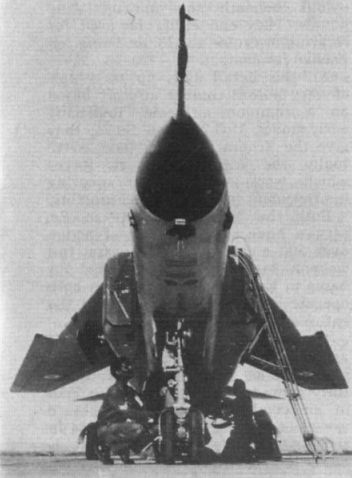 MiG-23B with its 23mm ventral cannon and weapon pylons under gloves and intake ducts. The sharply pointed ECM head above starboard outer pylon is prominent. The tandem two-seat MiG-23U (on photo) combines the strike fighter role with that of transitioning pilots. 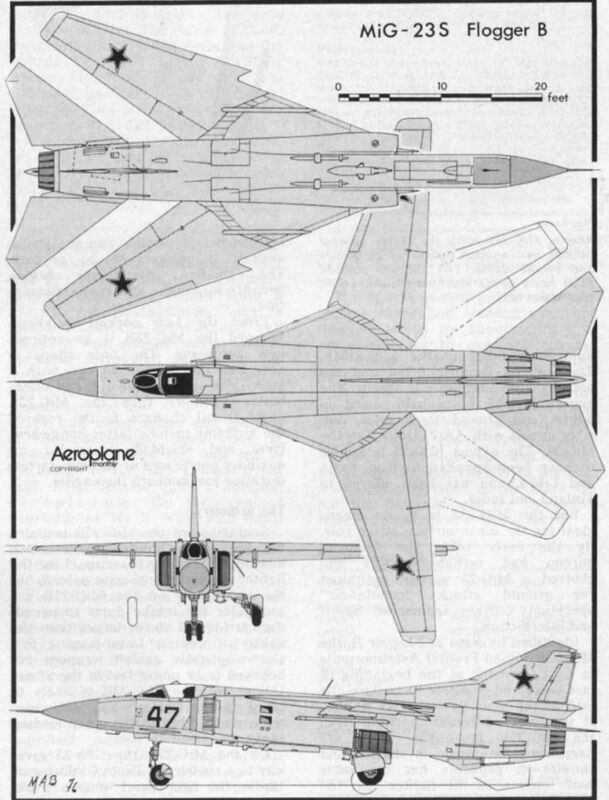 Possessing the same combat capability as the single-seat MiG-32B (Flogger-B), the MiG-23U apparently has the same overall dimensions, provision of a second seat resulting in some rearrangement of the internal fuel tankage. Noteworthy features of the MiG-23U include the raised decking aft of the tandem cockpits and the very substantial dorsal fin. 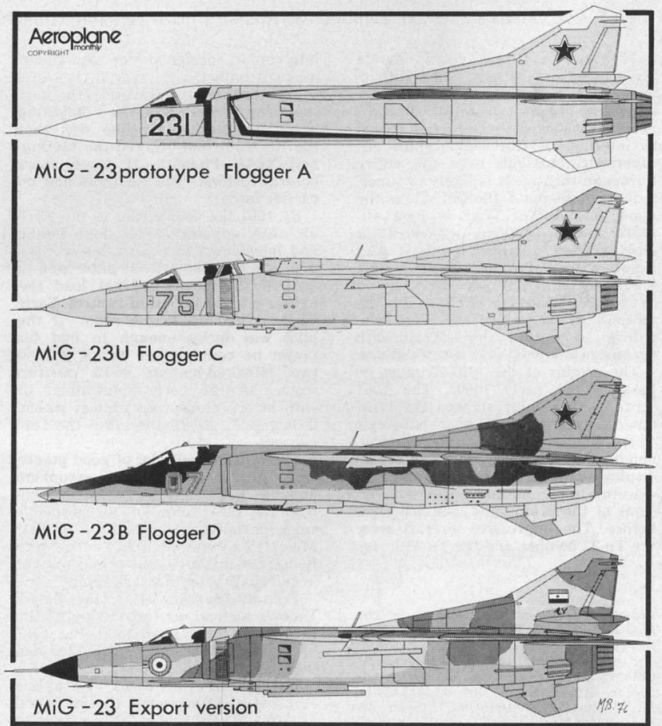 The MiG-23U Flogger C has a limited combat role, although it has been reported in use for electronic countermeasures duties. It also serves in the training role. The tandem two-seat MiG-23U (Flogger-C) features a retractable periscope for the rear seat occupant who is incorporated at some expense to internal fuel capacity.